ADF&G uses several models of imaging sonars and lenses to meet the varying needs of its sonar projects. In rivers where biologists need particularly high-resolution images of fish far from shore, for example, DIDSON and ARIS are equipped with a high-resolution lens (lower left) as opposed to a standard lens. 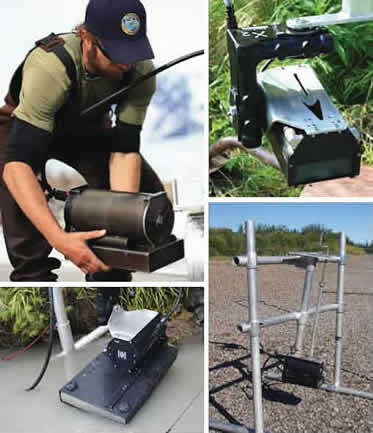 DIDSON - When the Alaska Department of Fish and Game adopted Dual frequency IDentification SONar (DIDSON) as a tool for detecting fish, inriver fisheries sonar advanced a giant leap forward. ADF&G biologists first encountered DIDSON at the University of Washington, where the Applied Physics Laboratory had developed it as a military tool for detecting enemy divers and underwater mines. DIDSON, now manufactured by the Sound Metrics Corporation (SMC)*, has become the sonar technology of choice for inriver fisheries sonar projects all around the world. ARIS - The latest generation of DIDSON technology, known as ARIS (Adaptive Resolution Imaging Sonar), was first tested in Alaska in 2012. ARIS provides more flexibility than its predecessor by allowing the user to vary a wider number of parameter settings. Depending on need, this can enable improved image resolution and finer control over the range covered during sampling. ARIS is currently being used in several Alaskan rivers for both counting and sizing salmon. Counting fish using DIDSON and ARIS is similar to counting fish from a counting tower. A technician in a counting tower watches and counts fish swimming in the water below, while a technician watching DIDSON or ARIS video counts images of swimming fish. But unlike a technician counting fish from a tower, a technician counting DIDSON and ARIS fish images can slow down, replay and even stop the video if they are fatigued or lose their place. Imaging sonars can produce high-resolution video images of fish, in part because it uses high-frequency sound waves that enable it to detect the entire surface of the fish. DIDSON was the first inriver sonar to be able to do this. Using DIDSON or ARIS, technicians can better distinguish between fish that are swimming side-by-side or head-to-tail and determine which direction fish are swimming. Knowing the direction in which fish are traveling is important in rivers where fish tend to mill. Scroll to the bottom of this page to see examples of DIDSON images. Imaging sonars are multi-beam sonar that emit a fan of sonar beams into the water column horizontally. When emitting 48 beams, DIDSON and ARIS can be used to detect fish up to 164 feet from the transducer. When emitting 96 beams, they can be used to detect fish up to 98 feet from the transducer. The resolution of the images produced by DIDSON and ARIS increases with the number of beams used. 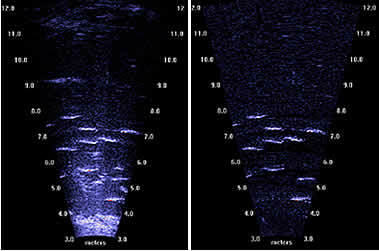 Most sonar technologies—including Bendix and split-beam sonar—use only one beam to ensonify an area of the river. Imaging sonar uses a fan of multiple beams. One of the advantages of imaging sonar is that biologists can use it over a relatively uneven river bottom. Prior to DIDSON, biologists could not use sonar over an uneven river bottom without compromising fish detection. DIDSON and ARIS software allows an observer to subtract the display of the bottom and stationary objects from the screen, leaving only the moving fish images. The frame at left shows an image with the bottom and stationary objects displayed while the frame at right shows the same image without them. No sonar system used in rivers has the ability to differentiate fish species of similar size based solely on sonar data. However, length measurements of migrating salmon obtained from DIDSON and ARIS images have been shown to be sufficiently accurate for use in differentiating between fish species of different sizes. Larger king salmon, for example, can be distinguished from other smaller species of fish such as sockeye salmon using length measurements taken from DIDSON and ARIS images. Sufficiently accurate length estimates from DIDSON and ARIS images of fish can be obtained up to a range of approximately 100 feet from the transducer. ADF&G biologists on the Kenai River started using fish lengths from DIDSON images in 2010 and ARIS images in 2012 to differentiate between large king salmon and other smaller species of salmon. As another possible means of separating fish species using sonar, biologists have examined differences in tail-beat frequencies observed in DIDSON video images. More research is necessary to determine if tail-beat frequency can be used to differentiate between species. Marking tools included with the DIDSON and ARIS software are used to obtain measurements directly from fish images. To use an imaging sonar as a tool for classifying fish species based on size, biologists develop a protocol that allows for processing large amounts of data in a manageable amount of time. Imaging sonars can produce more than 30 GB of data per day for some ADF&G projects. Reviewing data and manually measuring individual fish is both labor and time intensive. ADF&G has investigated protocols to automate fish size measurements, but all are site-specific and none have yet proven satisfactory for the high-density fish passage rates that occur in Alaskan rivers. For this reason, ADF&G will continue to manually measure fish images until automated methods are shown to be accurate over widely varying environmental conditions and high density passage. 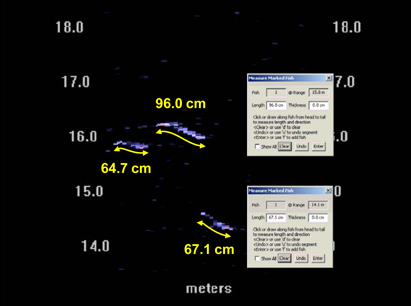 Examples of automatic fish sizing software from SMC (left), and Myriax, LTD (right).